Do you remember this block of Westport Road from Broadway to Central? The bank at the corner of Westport Road and Broadway looks much the same today as it did in this 1940 photo. The block it occupies looks much the same as well. Although businesses have come and gone, the block hasn’t changed much since the early 1900s when most of its structures were built. This map of old Westport shows the main cluster of businesses at Westport Avenue and Pennsylvania. The only building shown in this week’s featured block was the home of physician Joel Morris. century, with Westport Road making the transition from an important trail leading west to a commercial shopping area for surrounding neighbors. As the 1920s began, the block along Westport Road began to take on a more commercial face. While Archibald remained a residential street, businesses along Westport Road became more densely-packed as the surrounding neighborhood was built up and streetcars made the block as easy-to-reach destination. 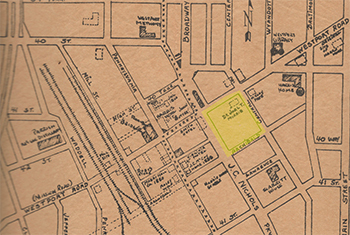 In this 1895-1907 map, the same block contained scattered brick buildings (in pink) as well as frame business and residential structures. Like much of Midtown, the rising popularity of automobiles led to major alterations in business areas. By 1940, a gas station had replaced older frame residences at the corner of Broadway and Archibald. 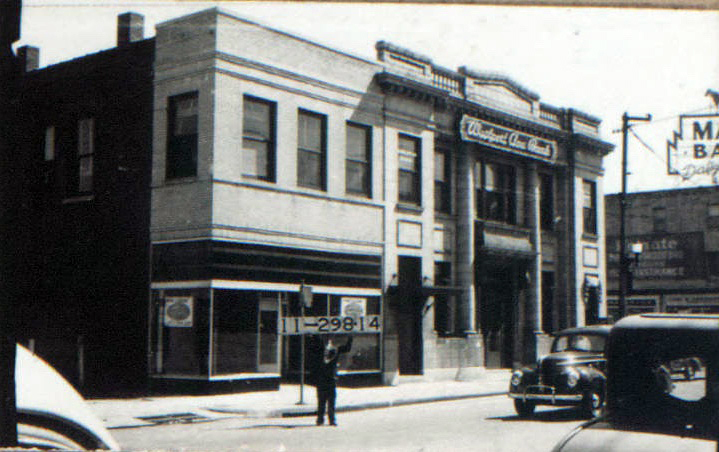 The Westport Avenue Bank, which moved to the corner of Westport and Broadway in 1920, in 1942 bought neighboring Weatherproof Products Company, which sold linoleum, in order to expand bank parking. The slideshow below shows the businesses and homes on the block in 1940. A recent aerial photo of the block with its remaining buildings and parking lots. I would be interested to learn how the streets in one section of Westport became angled. Westport and Kansas City were originally two separate towns. 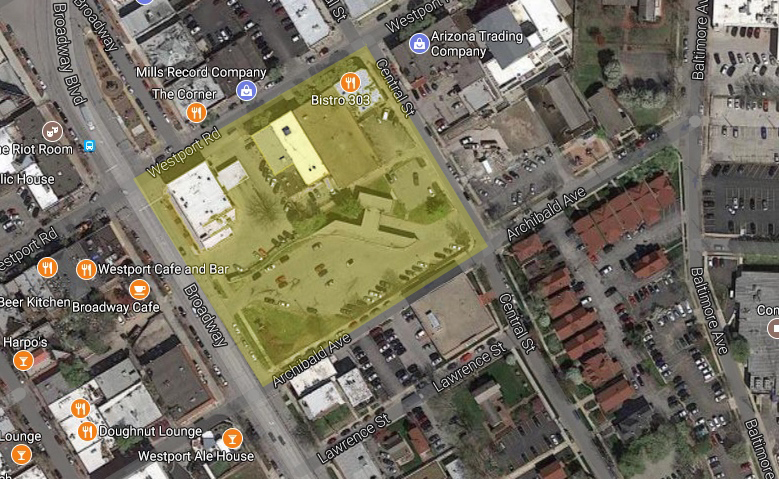 Westport was laid out on a different grid than Kansas City. When Westport was annexed into the large Kansas City, its streets did not fit neatly into the east-west grid, but went off at an angle. My father, Wyatt Jenkins and Merle Fowler owned and operated the Westport Printing Co at 411 Westport Rd from about 1942 to 1950. I, and my brothers and sisters, worked there part time while attending school., as did the Fowler children. Dad banked at the Westport Bank. My husband-to-be, unbeknowns to me, worked part time at the Westport Hardware – East of the Westport Bank – during the same time-frame. We all have many fond memories of that area known as “Westport”.